PT Patra Badak Arun Solusi - PBAS or referred to as "PBA Solusi" is a rapidly growing oil and gas company in Indonesia. 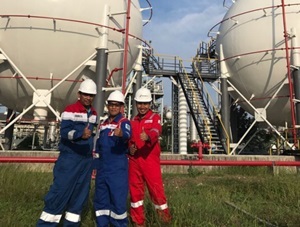 PBA Solusi has primary focus on the business of refinery processing facilities management services, including Engineering Procurement Construction (EPC) services, commissioning & startup, operation & maintenance (OM), plant services and training service. PT Patra Badak Arun Solusi is an affiliate company of PT Pertamina (Persero), the national oil company of Indonesia. As of December 2016, PT Patra Badak Arun Solusi is 96.01% owned by PT Pertamina Patra Niaga and 3.99% owned by PT Pertamina Dana Ventura. PBA Solusi has its legal domicile in Jakarta and its head office is registered at Graha PBAS, Jl Prof Dr Soepomo SH No 55 Tebet Barat, Jakarta Selatan 12810. In the business year of 2016, PBS Solusi generally recorded a good performance. According to PT Patra Badak Arun Solusi Annual Report 2016 as cited by JobsCDC.com, PBA Solusi booked total revenue of Rp658.3 billion in 2016. This number is equivalent with an increase of 56.1% from the previous year of Rp393.2 billion. Gross profit in 2016 reached Rp102.6 billion, increasing 67.8% compared to Rp61.1 billion in 2015. Referring to its annual report, PBS Solusi recorded a net profit of Rp35.8 billion in the year of 2016 or 95.62% increase from Rp18.3 billion in 2015. Required practical experience for minimum 15 years in EPC company and minimum 5 years at the same position. Communicative, Multitasking, high mobility, honest and initiative person. Male, minimum age of 40 years old. Minimum graduate with Bachelor of Safety & Environmental Engineering (S1) or related discipline. Required practical experience for minimum 15 years in EPC company and minimum 5 years as QHSE Manager. Advanced knowledge of ISO 9001, ISO 14001 and OSHA 18001, ISM, ISPS Standards and QHSE Management systems is highly preferred. Possess certification in Ahli K3 Lingkungan (Environmental Safety Expert – a mandatory certification from Ministry of Manpower). Familiar with Environmental Audit process. Required practical experience for minimum 5 years in EPC company . Minimum graduate with Bachelor of Electrical or Physic Engineering (S1). Required practical experience for minimum 5 years in EPC company. Advanced knowledge of ISO and OHSAS. Minimum graduate with Bachelor of Civil Engineering (S1). Good analytical, organizational and planning skills. Good in communication and negotiations skill. Minimum graduate with Bachelor of Electrical/IT (S1). Required practical experience for minimum 3 years in UPS and Battery Charger Maintenance Project. Strong leadership, communication and negotiations skill. JobsCDC.com now available on android device. Download now on Google Play here. Please be aware of recruitment fraud. The entire stage of this selection process is free of charge. PT Patra Badak Arun Solusi - Officer, Engineer SPV, Manager Pertamina Group February 2018 will never ask for fees or upfront payments for any purposes during the recruitment process such as transportation and accommodation.